Carefully add the batter to the pan. 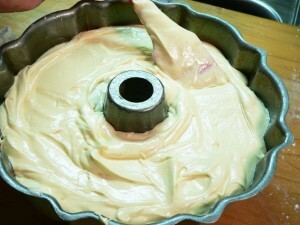 I held the bowl and turned the Bundt Pan as I poured the batter. Then, I used my spatula to smooth the batter out inside, and get it as level as possible all around the pan.